A child’s Christmas in Smalltown, U.S.A.
An excerpt from City Limits: Memories of a Small-Town Boy, my first book, published in 1991. 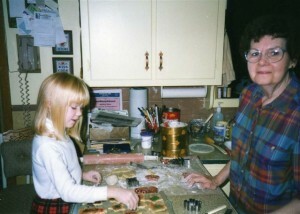 Not long after Thanksgiving, my mother would spend the better part of a Saturday afternoon making Christmas cookies and filling two round aluminum tins with dark brown squares of homemade chocolate fudge so rich that we were allowed to eat only one piece at a sitting. David and I cut the sticky cookie dough into stars and bells and silhouettes of Santa Claus and lovingly laid each piece on a greased cookie sheet. The Santa Claus cookies were special, for I took Santa Claus seriously. I left him a glass of milk and a plate of Christmas cookies before going to bed on Christmas Eve, and they were gone by sunup. When I was six years old, my family moved to 713 Hickory Drive, a house without a chimney. We had a long, tense family discussion that year about how Santa Claus would be able to get into our new house to bring us our presents. My father, a true man of the world, calmed me down by explaining that Santa Claus had a master key that unlocked the front door of every house on earth. One terrible morning, my Sunday-school teacher announced in a matter-of-fact voice that there was no Santa Claus, a piece of news that left me choking back tears for the rest of the day. It took a little while for me to figure out that since the presents that magically appeared under the tree every year weren’t coming from the North Pole, they must be stashed somewhere in the house. That was when I gave up on Santa Claus and took matters into my own hands. I worked my way through all the upstairs closets. I opened every drawer and inspected every shelf that I was tall enough to reach. I spent whole afternoons quietly poking around the basement, a dark, cluttered cavern full of dusty shelves and moldy cardboard boxes, every one of which had to be opened and checked out. Hunting for Christmas presents became an annual ritual, one that helped to ease me through a bad patch in my childhood: the year we added two rooms to 713 Hickory Drive. I don’t think my parents ever quite understood how frightening it is for a child to see his home torn up and transformed right before his eyes. To make matters even worse, my very own bedroom was schedule for demolition. After years of sharing a room with my brother, I had been allowed to move into the guest bedroom, which contained a phonograph and a long bookshelf and a double bed with flabby springs and a soft mattress. No sooner did the carpenters show up than this sumptuous retreat vanished in a cloud of sawdust. Before the week was out, my bedroom had become a hallway and four clothes closets. My father swore I’d have a bigger bedroom, but I didn’t care. I was furious. My fury softened after I moved into my parents’ old bedroom, a bright and spacious corner room complete with half-bath, and it disappeared altogether as soon as I learned that one of the new closets would be lined with cedar panels. I loved the tart, cinnamonlike fragrance of cedar, so much so that I occasionally sat in the closet and read books by flashlight. Within a few months, it was so full of clothes that I couldn’t sit down anymore. By that time, though, I had a more compelling interest in the cedar closet, for I discovered one December afternoon that my parents were using it to hide Christmas presents. This discovery, about which I said nothing for several years, made it possible for me to keep track of the arrival of incoming presents. It also taught me how satisfying it is to keep a secret. When the top shelf of the cedar closet was filled to the ceiling with toys, I knew it was time to bundle up, jump in the car, and drive down snowy country roads to spend Christmas Eve with the family. My grandmother started cooking when the sun came up, and by the time we got to Diehlstadt, you could smell the turkey and dressing a block away. After the last roll was buttered and the last gooey dessert tasted, we loosened our belts and sat down in the living room, where a scrawny little Christmas tree shed pine needles on an enormous mound of gifts. My grandmother invariably bought pathetic-looking Christmas trees whose limp branches drooped toward the floor like the arms of a starving man. I can’t imagine where she got them. Maybe she grew them in the root cellar out back…. 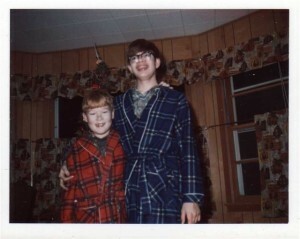 Once we got home, David and I put out milk and cookies for Santa Claus and went to bed. 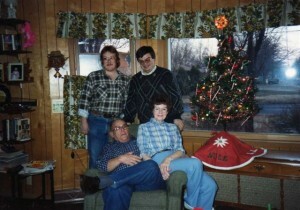 Though we usually tried to stay up as late as we could, we never complained about going to bed early on Christmas Eve. We knew that the sooner we went to sleep, the sooner we would wake up and run down the hall to the living room in our pajamas and start tearing open presents…. My mother tucked me in and sang a chorus of “Winter Wonderland,” my favorite lullaby. Then I closed my eyes tightly and listened for the faint rustle of boxes being pulled out of the cedar closet. 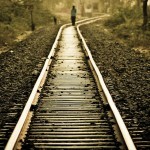 Weary from the long, happy day, I soon fell fast asleep.